Catfish can be, well, muddy tasting, especially bullheads and flathead catfish, which can live in really stagnant water. Channel catfish, which is the variety you can buy as farmed catfish, tends to be cleaner. Blue and white catfish are also of higher quality. This recipe is for small cats, less than 18 inches long. You steak the cats without skinning them, which saves a lot of work, because while there is more than one way to skin a cat, all are a pain. You do have to flake the meat off the bones as you are eating it, but it comes right off. The skin helps thicken the sauce. You'll need Asian fish sauce for this recipe, but it is easily available in large supermarkets, and, obviously, in Asian markets. In a pinch you can substitute Worcestershire, but it's really not the same. I also call for lard. Please try to get it, as it really makes a difference in the flavor. The finished dish is a wonderfully powerful hit of sweet-spicy-salty-savory. 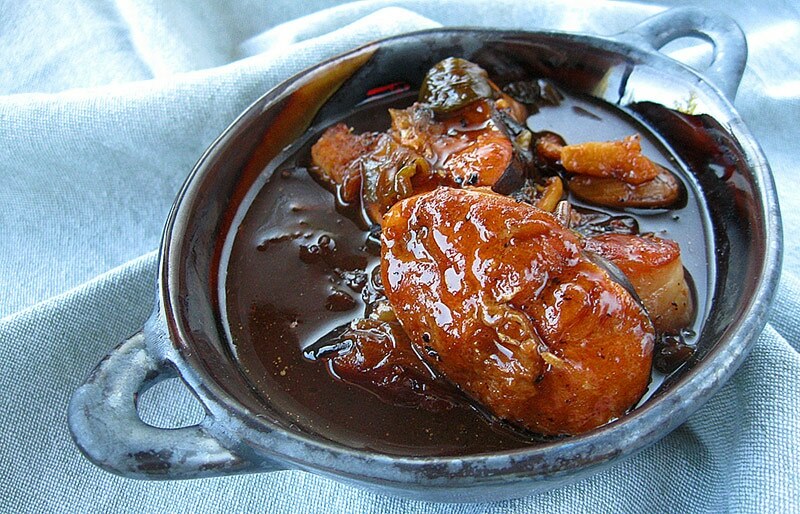 I can see why the claypot catfish is a classic in Vietnam. Serve this with plain white rice and a beer. 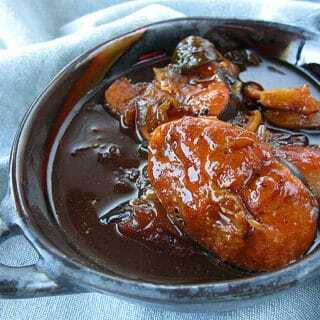 Mix the brown sugar, black pepper, molasses and fish sauce and coat the fish in it. Let this stand for 15-30 minutes. In a pot just large enough to contain the fish, heat the lard over high heat and saute the garlic, chile and scallions for 1-2 minutes. Do not let them brown. Add the catfish and all the marinade. Mix well, turn the heat down to medium-low, cover and simmer for 10 minutes. Pour in enough water to almost cover the catfish, then turn the heat to medium-high. Cook this uncovered until the sauce reduces by half, about 10-15 minutes. Be sure to turn over the fish a couple times so both sides get coated by the sauce. Turn out the fish into a bowl, and serve with white rice. Have a bowl on the table for everyone's fish bones. DYANAMITE!!! The switch to molasses is a super tip. I always order #106 when we go to our favorite Pho restaurant. And now I have been able to almost duplicate it. I use a Lodge castiron pot as well as a traditional clay pot, I can make twice as much in the Lodge. OMG!!!!! When this recipe “popped up”, I focused on the 3rd paragraph: “this recipe is for small cats.” I was APPALLED!!!! I have since recovered and understand you are referring to catfish ….. but GEEZ!!! Recipe sounds great and I’m going to try it this weekend. Put a little whiskey, rum or your choice of spirits into a small squeeze bottle. As soon as the fish is caught, even while on the hook, give it a shot of spirits in the mouth or gills. This will immediaetly take the spirit (no pun intended) out of the fish, and all movement will cease. It works on large as well as small fish, but cautious when handling fish that can bite – like barracuda.